Wat Sene in Luang Prabang is a favorite gathering spot for tourists and alms givers (mostly tourists taking up half of the space) to offer alms to the monks. It can be quite noisy and chaotic at times with people chasing the “perfect photo shot”. The last time I was there in February, the area was a bit calmer with the majority of the tourists observing the Morning Alms Offering from a distance, on the other side of the street. I felt sad watching the people there, with so much commotion, it was like being at a “human zoo” zone. We are all part of the problem, all trying to catch that “perfect” image. Of course, I don’t feel good being part of the problem myself but I do my best to observe the timeless religious act in the most respectful manner as possible. 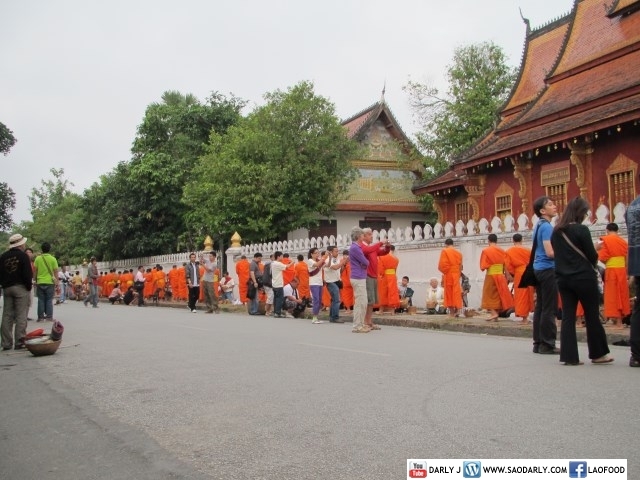 It would be nice if we all put an effort to follow a Guide on Morning Alms Giving in Luang Prabang.